I have my African grey boy for 4,5 months now, he's almost 2 years old and had only one owner previously. He has amazing personality and such a fast learner, he learned already so many new words and sounds from me. He's very comfortable with me and constantly staying on his one leg, and has the belly shiver when I even talk to him ( the sign that he's actually happy). He doesn't have any problem to take food from my hands and even from my lips and he gives me lots of kisses, he's not scared to be very close to my face and even touches my hair with his beak, but at the same time in no way he will step up on my hand ( but he was stepping up on the previous owner). As soon as I'll put my hand next to him in the position to step up he becomes very scared and sometimes even starts to shiver or he's trying to "fly away". He can't fly at all as when I got him the previous owner clipped his wing terribly ( the vet did ), only 1 wing was clipped which is totally wrong and was literally until the "meat" ( so he had no feathers there at all, and he was falling so many times that I constantly had blankets on the floor so in case he falls he won't hurt himself. Still at the beginning he even had a bit of blood there which was extremely upsetting. Hopefully the wings grew a bit back after quite a long time even if he still can't fly. I've never done anything bad to him to be so scared of my hands for the stepping up, so I really don't understand his reaction. I can see he loves me and he's constantly looking for contact with me but at the same time he doesn't let me touch him completely. He doesn't live in his cage. I mean, I put the training stand right next to his cage with an open door so he can get out any time and goes from the cage's door to the stand and he's always free, he also sleeps on the stand or inside his cage whenever he wants ( I don't cover him at night, I just turn the light when he's ready to sleep). I'm extremely patient with him as I do love him a lot but I'm getting a bit desperate with what to do and how to make him step up and what am I doing wrong? Any of your advice will be much appreciate it and I really hope someone can help me with it. Hands are really scary to birds since they are prey animals. Faces are safe. Don't push him. He will come to you in his own time. Myrtle was scared of hands. I offered her my shoulder and she would travel around the house with me even though I could not touch her. All of my birds are rescues except one. My cockatiels are in a flock and I have to go by personality. I do not try to touch them but they are free and will come and touch me. If I sit on the floor they will come and walk all over me but I have to keep my hands still. They are coming around. Each one does it in his own time. Welcome to the forum, Angie and ? [you did not tell us his name]. Now, before anything else, I would not worry overmuch over the situation and I'll tell you why. First of all, at 2 years of age, he is only now beginning to go into his 'adulthood' and young birds are always much more insecure than adults. To add to this, he was rehomed while he was still a juvenile and at an age when, in the wild, he would not have yet left his parents so this adds to the insecurity. Second, four or five months are nothing to a parrot. The honeymoon period lasts, on average, 3 or 4 months BUT there are birds that take longer and grays, being naturally high-strung birds that HATE change, are usually more recalcitrant than other species to bond with a new human. Then you have the clip which, to put the icing on the cake, is an unilateral one and, BY FAR, the worst kind a bird can get because the poor bird loses complete control over its movements. A mild bilateral clip allows them to glide [not that I approve of any clip!] but a unilateral drastic clip makes them fall to the ground like a rock -as you have observed- and leaves the poor bird is the most vulnerable position [not a good thing for the mind of a prey bird that has lost the only home he has ever known while still too immature to deal with the change]. As to his behavior... grays are not touchy-feely birds unless they are hormonal so his not wanting you to touch him is pretty normal. If and when they are deeply bonded to a human [which -of course- implies complete trust], they do like to have their heads, necks, cheeks and 'chin' scratched softly but they only like their human to touch their bodies when they are hormonal. People say that this not true, that their grays are very cuddly but what they don't realize is that it's because they are giving them the wrong diet and keeping them at a human light schedule all year round making the poor bird overly hormonal. Basically, it's not really love, it's just arousal. I don't know where you read or heard that the 'belly shiver' means they are happy. I've never observed this behavior [I've had six grays under my care] and I've also never read or heard about it, either. I don't know why your bird does it but, usually, any kind of shaking/tembling/shivering in a bird means fear or anxiety. Now, you say that you have never done anything bad to him and I believe you 100% because I can tell that you love him and worry about him but, unfortunately for them and us, parrot behaviors are outside our range of understanding. We simply can't read their behaviors accurately. We know all about and can read without a problem even the subtlest of mammal behavior because it's our own and because the animals that we are used to cohabiting with are mammals -dogs and cats- but, when it comes to birds, we are in the dark and have to teach ourselves about them from scratch making sure that we are not merely either anthropomizing or wrongly adjudicating mammal behavior to them. To make a long story short: things that don't seem bad to us, are bad to them. I will give you one example: you say that when you put your hand to him for step up, "he becomes very scared and sometimes even starts to shiver or he's trying to "fly away". Well, I am afraid that putting your hand in front of him and asking him to step up when he was obviously not ready and highly distraught by it was the wrong thing to do and that, in fact, set you and your bird back instead of forward. I am usually very successful in getting problem birds to accept me, trust me and even love me [all my birds came from somewhere or somebody else] and I will share the one 'trick' that does it: I NEVER EVER EVER ask them for a closer relationship than what they are willing to give -and that means never asking them to step up unless they show me that's what they want. I don't know what, exactly, you did when you first got him but I'll tell you what works for me. I open their cages when the sky is beginning to get the first light in the horizon [this time of the year, it's at 5 am]. I say "Good morning" and 'Come out?" and walk away. I never put my hand inside their cages to ask them to step up or my hand up to them when they climb to the top of it. As the sky gets lighter [there should be no artificial lights on until the sun is already high over the horizon], they get their raw produce which I share with them [or pretend to because I draw the line at eating raw green beans or green peppers but I do share all their fruits]. A word of advice, don't offer him food from your mouth or even a piece of produce where you have bit a piece. Human mouths have a HUGE amount of bacteria for which they have no defense [they all belong to undomesticated species and nature did not give them any good bacteria that would kill our bad bacteria]. I watch the new birds carefully, looking for signs that they want to get closer to me and, if I see one, I -VERY tentatively- approach them by standing close to them, talking, offering a treat, etc. If the bird is clipped or not used to flying and I see it wants to get on me [the bird will move closer to the side where you are and lean its body forward, sometimes, fluttering its wings], I offer them my shoulder [I never ask them to step up first because, as Liz mentioned, hands are scary things to them] in a nonchalant way [meaning I kind of just stand close enough so they can 'jump' to it without even turning my head to look at them -staring at a bird that doesn't know or trust you would make it VERY nervous]. But, usually, they end up stepping up before they do this because birds that are imprinted to people, which have not been severely neglected or abused and which have learned to trust their new human don't need to be asked because they, themselves, want to get on their human. Now, the process that ends in their feeling completely comfortable with me [I am talking about trust] takes as long as it takes and I never rush it because it depends on the individual bird and its background. A well-loved, self-assured bird doesn't take long but birds that might have 'issues' do. I have a male amazon that was abused by his previous owner [which was not his first owner]. The man actually admitted to me that he would 'take his fist' to the bird each time the bird bit him - needless to say, the bird hated him with a passion and became highly aggressive to him and all other humans. This bird does not step up to my hand and I doubt he ever will but he goes on a stick, obeys a number of commands, takes treats from my hand and hasn't attacked me at all in almost a year [and this is a male Yellow Nape -a species considered highly aggressive- which has a mate that nests and lays eggs during breeding season - I do NOT breed them, I just let them go through all the natural stages of the breeding season because I believe that it makes their lives 'complete']. He attacked me last year during breeding season when I got too close to his nest but it was only that once and he hasn't done it this year [he did go after my husband when he was in there fixing the birdroom but did not really bite him so he has gotten better]. And this is an extreme case because the 'normal' new birds never bite me. I have a caique that I got in late October or early November and a quaker that I got a few months ago and they both step up without a problem, perch on my shoulder, give me kisses, etc. The caique took this long to completely stop his bad-temper pinching with his beak when he was annoyed [I suspect he was spending most of his time in a cage without any personal attention for quite a long time before he came to me] but he never really bit me or showed fear of me - and the quaker took to me almost immediately but then her previous owners were very responsible people who, as soon as they realized they could not devote enough time to her, found her a new home AND I do have a VERY strong affinity with quakers [they come from my country of birth and my grandmother and I used to hand-raise them so we could release the babies back to the wild when I was a child so I grew up with them]. - Evaluate your husbandry objectively: diet, light schedule, ligth quality, daily routine so he is as physically comfortable as he can be [parrots don't adjust well to a human environment so it's up to us to change our environment and schedules to fit their needs]. - Give him time to feel comfortable with you and observe his behavior analitically and objectively -what reaction does he have to what stimulus? that kind of thing... make mental notes or, even better, written ones and periodically compare the current behaviors with previous ones. But don't 'assign' feelings to the behaviors because, as I said before, we are all real bad at guessing what goes on in the bird's mind and usually misread them. - Don't ask him for anything that prompts a negative reaction in him and act nonchalantly -meaning, spend many hours in the same room with him, talk/sing/whistle, dance to him, offer him a treat every now and then but in a casual manner without appearing to concentrate your attention on him [predators do that]. - Don't try to train him until he is bonded to you. 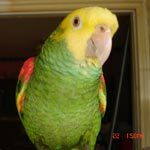 Training sessions can be a good experience for the bird but the bird needs to trust you implicitly and love you first and rehomed birds would, sometimes, need quite a long time for this to happen. Let me know if there is anything that needs further clarifying. Myrtle came from a very dark place and would even shiver when she was scared. She was clipped which even made it worse. She knew she was in good home with someone who cared but took a long time to adjust and consider me safe. The first time this happened I was near. She climbed up my pants leg onto my shoulder for safety. I walked to the cage and let her get off onto the top. Then any time she jumped off she would come to me to climb up and be carried back to the top of her cage. From there I would offer my shoulder while she was on top of the cage. I would walk her room to room and let her see the others in the house. I would then take her back to the top of her cage. Of course I talked to her the whole time.